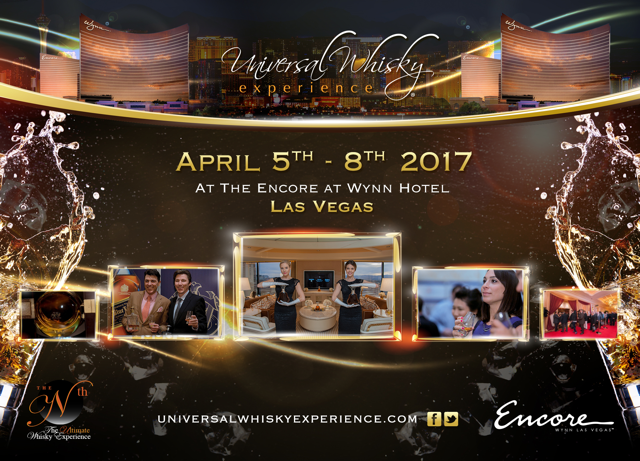 The Universal Whisky Experience, the world’s first luxury whisky tasting show, is scheduled for April 5- 8, 2017 at Encore at Wynn Las Vegas. Founded seven years ago by real estate developer and whisky enthusiast Mahesh Patel, the memorable experience is now a four-day destination event with exclusive tastings of the world’s finest whiskies for connoisseurs and collectors alike, and intimate opportunities to mingle with Master Distillers and Blenders. This year’s show will include special surprises to celebrate Whisky Icon Richard Paterson 50 years in the industry. All Nth Guests will be invited to attend seminars and exhibition with a grand finale celebration on Saturday 8th April. “Whisky enthusiasts value curated experiences as well as rarity and exclusivity, says Patel. For this year’s event, one of the highlights, an exclusive Diageo Whisky Dinner at Joel Robuchon restaurant at MGM Grand will kick-off the four-day Ultimate Whisky Experience in Las Vegas he added”. Brand Master Classes hosted by Master Distillers and Blenders will be held Saturday, April 8th sharing experiences, knowledge, and rare sips with guests. This year’s event will also showcase some of the world’s most expensive bottles of scotch. Total value of whiskies that will be showcased are estimated over $3 Million. High Roller Experience –Thursday, April 6 – Saturday, April 8 at $2,995.00. The premium package includes exclusive access to all show event and tastings including: High Roller Day on Thursday, April 6th with Private High Roller Salon Tastings and Exclusive High Roller Super Pours, Private Events with other High Rollers, One-on-one meetings with brand ambassadors, Whisky Speed Dating event at the elegant Chairman’s Salon, All Super Pours at the Nth 2017 main tasting show, Nth 2017 Show and Gourmet Dinner Event, Richard Paterson Exclusive High Roller Master Class on Friday April 7, Exclusive Master Classes on Saturday April 8, Unparalleled High Roller Gift Bag and Access To Richard Paterson Celebration event on Saturday April 8th. Connoisseur Experience – Friday, April 7 at $545.00. Guests seeking a high-touch experience with a few extra indulgences without going over the top will enjoy the main tasting show, hors d’oeuvres, and receive a cut crystal Glencairn tasting glass on Friday, April 7. Access to Richard Paterson Celebration event on Saturday April 8th. The Companion Experience – Friday, April 7 at $295.00. Companions can enjoy the show for the Experience on Friday, April 7. Instead of whisky they can enjoy premium red and white wines, Champagne, hors d’oeuvres, and receive a souvenir Glencairn engraved champagne flute. Access to Richard Paterson Celebration event on Saturday April 8th. “The Universal Whisky Experience is one-of-a-kind access to sips of rare whiskies, often poured by the Master Distiller himself,” says Patel. “The event provides a forum for whisky enthusiasts and collectors to trade notes on their own purchases and collections,” he said. Complete program information and ticket sales can be found at www.universalwhiskyexperience.com. The Universal Whisky Experience was founded by C.E.O. Mahesh Patel, a successful commercial real estate developer in Atlanta, Georgia. Patel’s great passion in life is whisky, namely “Scotch” whisky. A connoisseur and enthusiast, he frequently attends exclusive whisky events and gatherings both domestically and abroad. He is an avid collector of fine and rare whiskies. Mahesh found a need in the marketplace and leveraged his special relationships to create The Ultimate Whisky Experience, the world’s most luxurious whisky event.